This module offers classes representing filesystem paths with semantics appropriate for different operating systems. 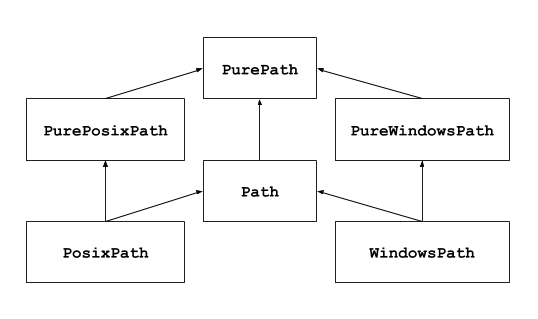 Path classes are divided between pure paths, which provide purely computational operations without I/O, and concrete paths, which inherit from pure paths but also provide I/O operations. If you’ve never used this module before or just aren’t sure which class is right for your task, Path is most likely what you need. It instantiates a concrete path for the platform the code is running on. If you want to manipulate Windows paths on a Unix machine (or vice versa). You cannot instantiate a WindowsPath when running on Unix, but you can instantiate PureWindowsPath. You want to make sure that your code only manipulates paths without actually accessing the OS. In this case, instantiating one of the pure classes may be useful since those simply don’t have any OS-accessing operations. PEP 428: The pathlib module – object-oriented filesystem paths. For low-level path manipulation on strings, you can also use the os.path module. Pure path objects implement the os.PathLike interface, allowing them to be used anywhere the interface is accepted. Changed in version 3.6: Added support for the os.PathLike interface. pathsegments is specified similarly to PurePath. Regardless of the system you’re running on, you can instantiate all of these classes, since they don’t provide any operation that does system calls. Calling bytes is only recommended under Unix. Under Windows, the unicode form is the canonical representation of filesystem paths. If you want to walk an arbitrary filesystem path upwards, it is recommended to first call Path.resolve() so as to resolve symlinks and eliminate “..” components. Represent the path as a file URI. ValueError is raised if the path isn’t absolute. With PureWindowsPath, return True if the path is considered reserved under Windows, False otherwise. With PurePosixPath, False is always returned. File system calls on reserved paths can fail mysteriously or have unintended effects. Match this path against the provided glob-style pattern. Return True if matching is successful, False otherwise. Concrete paths provide the following methods in addition to pure paths methods. Many of these methods can raise an OSError if a system call fails (for example because the path doesn’t exist). Changed in version 3.8: exists(), is_dir(), is_file(), is_mount(), is_symlink(), is_block_device(), is_char_device(), is_fifo(), is_socket() now return False instead of raising an exception for paths that contain characters unrepresentable at the OS level. Return information about this path (similarly to os.stat()). The result is looked up at each call to this method. If the path points to a symlink, exists() returns whether the symlink points to an existing file or directory. Using the “**” pattern in large directory trees may consume an inordinate amount of time. Return the name of the group owning the file. KeyError is raised if the file’s gid isn’t found in the system database. Return True if the path points to a directory (or a symbolic link pointing to a directory), False if it points to another kind of file. False is also returned if the path doesn’t exist or is a broken symlink; other errors (such as permission errors) are propagated. Return True if the path points to a regular file (or a symbolic link pointing to a regular file), False if it points to another kind of file. Return True if the path is a mount point: a point in a file system where a different file system has been mounted. On POSIX, the function checks whether path’s parent, path/.., is on a different device than path, or whether path/.. and path point to the same i-node on the same device — this should detect mount points for all Unix and POSIX variants. Not implemented on Windows. Return True if the path points to a symbolic link, False otherwise. False is also returned if the path doesn’t exist; other errors (such as permission errors) are propagated. Return True if the path points to a Unix socket (or a symbolic link pointing to a Unix socket), False if it points to another kind of file. Return True if the path points to a FIFO (or a symbolic link pointing to a FIFO), False if it points to another kind of file. Return True if the path points to a block device (or a symbolic link pointing to a block device), False if it points to another kind of file. Return True if the path points to a character device (or a symbolic link pointing to a character device), False if it points to another kind of file. Like Path.chmod() but, if the path points to a symbolic link, the symbolic link’s mode is changed rather than its target’s. Like Path.stat() but, if the path points to a symbolic link, return the symbolic link’s information rather than its target’s. Create a new directory at this given path. If mode is given, it is combined with the process’ umask value to determine the file mode and access flags. If the path already exists, FileExistsError is raised. If parents is true, any missing parents of this path are created as needed; they are created with the default permissions without taking mode into account (mimicking the POSIX mkdir -p command). If parents is false (the default), a missing parent raises FileNotFoundError. If exist_ok is false (the default), FileExistsError is raised if the target directory already exists. If exist_ok is true, FileExistsError exceptions will be ignored (same behavior as the POSIX mkdir -p command), but only if the last path component is not an existing non-directory file. Changed in version 3.5: The exist_ok parameter was added. Return the name of the user owning the file. KeyError is raised if the file’s uid isn’t found in the system database. The file is opened and then closed. The optional parameters have the same meaning as in open(). Rename this file or directory to the given target. If target points to an existing file or directory, it will be unconditionally replaced. If the path doesn’t exist and strict is True, FileNotFoundError is raised. If strict is False, the path is resolved as far as possible and any remainder is appended without checking whether it exists. If an infinite loop is encountered along the resolution path, RuntimeError is raised. New in version 3.6: The strict argument. Remove this directory. The directory must be empty. Return whether this path points to the same file as other_path, which can be either a Path object, or a string. The semantics are similar to os.path.samefile() and os.path.samestat(). An OSError can be raised if either file cannot be accessed for some reason. Make this path a symbolic link to target. Under Windows, target_is_directory must be true (default False) if the link’s target is a directory. Under POSIX, target_is_directory’s value is ignored. The order of arguments (link, target) is the reverse of os.symlink()’s. Create a file at this given path. If mode is given, it is combined with the process’ umask value to determine the file mode and access flags. If the file already exists, the function succeeds if exist_ok is true (and its modification time is updated to the current time), otherwise FileExistsError is raised. Remove this file or symbolic link. If the path points to a directory, use Path.rmdir() instead. An existing file of the same name is overwritten. Below is a table mapping various os functions to their corresponding PurePath/Path equivalent. Although os.path.relpath() and PurePath.relative_to() have some overlapping use-cases, their semantics differ enough to warrant not considering them equivalent.